All German Lessons are held in Standard High German. Most lessons are based on books following the European Standard of Language Learning. These books are bought by the student and provide material for one to two years of learning. Beginner and intermediate students will learn all basic language skills: speaking, listening, reading and writing. It is an option to shift the majority of the emphasis toward conversation for advanced students. All lessons are tailored to the student’s needs and his/her basic knowledge of grammar. It is not unusual and often helpful to have a grammar concept explained first with an example in English. Many students experience that they understand the grammar of their mother language for the first time by learning a second language. All ages and skill levels can benefit from private lessons. During the lessons, speaking, listening, reading and grammar are emphasized. You have an important influence on the speed of your progress. Students who spend twice a week, 30 to 60 minutes at home, advance almost twice as fast as students relying completely on the lesson itself. However both student types will be accommodated and will learn. Children who have learned to read and write can start learning German with an age-appropriate book. Younger children learn in a more playful setting using games like Memory, Go-fish and adjusted game ideas from Rummikub or Dominos and others. Older children still enjoy some of the more intellectual games but will have more traditional instruction and more dialogue exercises. High school children can prepare for American tests, like the AATG Tests, AP German Test or for German tests such as DSD 1 and DSD 2. Owners, managers and employees can enjoy learning a language inside the company without the hassle of driving to a school. Language learning is motivating and fun amongst one’s colleagues and adds to a company’s attractiveness. Single or group lessons are available. It is exciting to have old letters or documents from your grandparents or great-grandparents. A real piece of your family history waiting to once again reveal its content. But if it's in the old Sütterlin, Kurrent/Current or Kanzlei/Chancery script, it remains a mystery to most of us. Lucky for you, I have specialized in deciphering and translating letters in old German handwriting, mainly German to English. Should you have relatives from the border areas close to the Alsace, they might have written in French, and I can help with this translation too. ​​No letter or document is too short. Diaries from family members, written family stories or old postcards, all can be translated and the content made accessible to you and your genealogical research. Translating old German letters demands a special skill and an in-depth knowledge of old German words and idioms, a good sense of the different German dialects, and knowledge about the living style of 150 or more years ago. A surprising number of words are now obsolete. Over the years, I have acquired this knowledge by researching, reading old books, attending meetings of Genealogical societies, and visiting living history museums on my trips back to Germany. 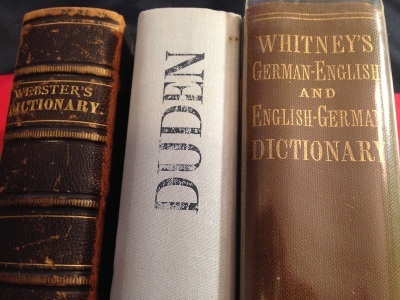 I possess dictionaries from 1844, 1877, and 1935, for example. Do you have a German relative or friend but you do not know German and they do not know English? You would like to stay in contact via letter writing or e-mail exchange? Let me help you with it. All translations are confidential and with a fast turnaround. Letters: Many Germans have a good basic knowledge of the English language, but might struggle with more commercial or technical terms. To ensure your message comes through clearly, have your letter translated by a German native speaker with eight years experience in an international company and wide knowledge of commercial and technical terms. Presentations: Maybe your German is in good shape and you need to prepare a quality presentation in German? You would like someone to look it over and make sure there are no spelling or grammar mistakes. Contact me. I can help you make your presentation shine from a language perspective. My areas of expertise include general commercial meetings, technical meetings, family visits, sightseeing as well as botany : ) .